Have you pre-booked your Silverstone Car Park space? There are two options for parking your car at the British GP. There is the official Silverstone car park which is situated behind the Luffield and Abbey grandstands, or Whittlebury Park offers car parking for either the whole weekend, or just race day. Whittlebury Car Park is a short walk from Copse Corner or Becketts. Parking is free at Silverstone on the Thursday before the Grand Prix for fans coming for the pit walk and evenings entrainment. 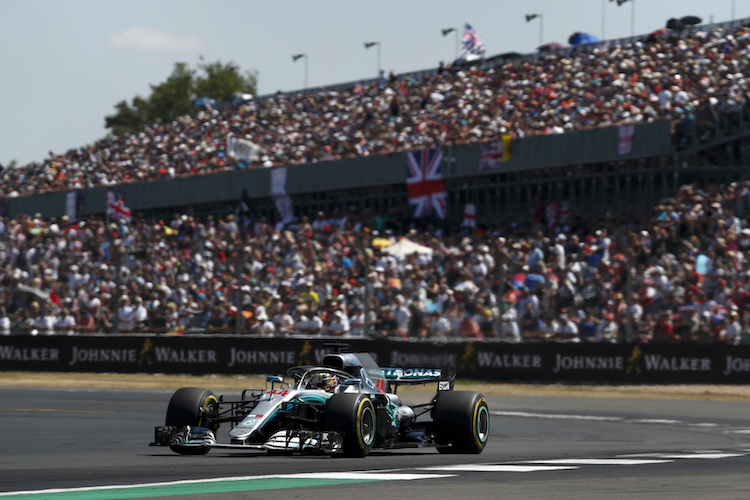 Options for parking for this years British Grand Prix have recently been updated with options to book at the circuit or one of the park and ride car parks either at the M1 or M40. The M40 Park and Ride is also taking bookings for Sunday only at just £11. To avoid the queues that may exist in or out of the circuit over the weekend, using the Silverstone Park and Ride service may well be for you! Park and Ride charges per car and ranges between £11 (Friday) and £31 (Friday-Sunday). You must book it in advance. There are two Park and Ride locations. One located for the M1 motorway users, and one for the M40. Friday: The first shuttle bus which leaves from the M1 park & ride to the Silverstone circuit is at 6:00am, and the last shuttle sis 6:30pm on Friday. The shuttle will come and go regularly until 10:30am and then commence again from 4:00pm. Saturday: The shuttles start at 5:30am until 11:00am and then from 4:00pm until 6:45pm. Sunday: The shuttles start at 5:30am until 11:00am and then from 3:00pm until 7:45pm. Another option is parking at a nearby Schools in Silverstone. Not only do you get a cheaper price but all the funds go to help the local schools. This is a popular choice, so we recommend you book early! Visit www.silverstoneschoolsparking.co.uk/ for more information. Hopefully this has given you all the information you need about British Grand Prix parking and park & ride. Please feel free to get in touch via our contact page if you require any further assistance. Could you please advise the operating times for the park&ride services for silverstone from the m1 (15a) pick up point. Hi Steve! I’m finding out the answer to that question right now. I’ll report back as soon a I get some feedback. Hi Steve. We have all the info you need – please see the updated Park and Ride section on this page. Could you please advise how long the shuttle bus from the M40 park and ride takes? This will be my first trip to Silverstone and was wondering what time I should leave Milton Keynes to get to the circuit?.. I have a parking pass for Friday and generally the journey is estimated as half hour but obviously traffic will be a lot heavy and I don’t want to miss first practise at 10am, any ideas on how long it will take? what is the earliest I can park at Silverstone on the Friday? Hi Christine! Good to hear you are not too far away from the circuit, but caution must be taken on F1 weekend as traffic can be pretty heavy. In answer to your question “What time do the Silverstone car parks open?”, I can confirm that it is about half an hour before the gate opening time. At the time of writing, gate opening times have not been confirmed for 2014 but in my experience it is usually around 6am. It’s that early for the die hard fans to stake out their favourite viewing points around the circuit – which many do! MK is 25 mins on paper from the the circuit, factor in the traffic, car park queues, gate admission queues and then walking to your viewing spot – if it was me I’d be out the door at 7am personally. That gives you 3 hours. You might get there with plenty of time to spare, but who knows if they’ll be a break down or accident on your route in? It’s a tough call to make. Your best bet is asking yourself how early would you be prepared to go? Which offers the quickest exit when the race is over, park and ride parking or parking actually at the circuit. Hi Barbara! With Park and Ride if you’re leaving straight after the race then you would need to queue for the buses, so there is a delay there. However, depending on where the marshals usher you into the main Silverstone car park, you can also find yourself on a very slow exit. I would say there’s probably not a huge difference and it would often come down to luck of the day, but Park and Ride is probably a slightly safer bet as the buses have priority access leaving the circuit area which can often be the slowest part of the exit. Yes no problem, anything up to sort of mini-bus/transit size is fine in standard parking. They have a coach car park but that tends to be for vehicles sort of 20+ people. I have won 3 day F1 tickets which come with free 3 day parking ticket (car pass). It is a pink numbered car sticker which states ‘public parking p event’. Where does this mean I can park? …. at the official Silverstone car park?! Hi Debbie! I can confirm that if your parking states ‘public parking p event’ then it is valid for the official circuit parking on Friday to Sunday. Hope this helps and enjoy the race weekend! Hi Natalie! In past years, there has been a meet & greet session with some of the drivers on the Saturday in the E Zones (entertainment zones) however they have not confirmed this for the 2014 race so I am unable to advise on this at this time. Keep an eye out on the site or our twitter feed (@enterF1) and we’ll try to get some information on that in the lead up to the race. Hi Natalie. I have some information for you! Does anyone have any experience how long the park and ride bus from towcester will take to get to the circuit? Im leaving from london very early so am trying to lock down an itinery as best i can….its showing its less than 15 mins away on the map, but will the P&R bus hit the same traffic queues as everyone else? I want to be in the grounds by 0900 latest, what time would i be looking to arriving at the park and ride park at towcester? Hi Dan! There are priority lanes reserved for buses so 15 minutes should be realistic from Towcester. Good luck and enjoying the weekend! It’s my first time at silverstone this year and am so excited!! Have seen, through this forum, about the pit walk, which I am going to come down for. Sounds incredible! Is it really just the case of turning up with your 3 day ticket and being allowed in? I can’t get there before just before 3, so hope that’s ok! Also, do you know where it’s possible to park on the Thursday? All the silverstone car parks only seem to mention the Friday-Sunday. Silverstone haven’t made it very clear have they! Your correct about your 3 day ticket allowing you access to the pit walk. As for parking you need to use car park 50, this will be clearly signposted when you arrive at Silverstone and parking is FREE for the Pit Lane walk. Yes I’ve used the words FREE and Silverstone in the same post! I have booked tickets for this Friday’s ‘Practice’ day @ Silverstone, and appropriate circuit parking. However – I need to contact someone to discuss / obtain disabled parking pass and am unable to get hold of anyone to speak to on any of the published telephone numbers. I either get no response at all, or am on hold for over three quarters of an hour. I’m sorry to say we’ve had similar problems this week getting through to Silverstone. Have you tried their twitter account? We often find we get a quicker response on Twitter than via phone or email. There details are https://twitter.com/SilverstoneUK. I’d be really interested to hear about your day and any tips you might have for fans using Silverstone disabled parking zones. Unfortunately I do not have a twitter account but if I do resolve this before we get there on Friday I will let you know. I’ll try on our twitter account now and get back to you if I hear anything. This is the cryptic answer from Silverstone’s twitter account..
I’m travelling up with friends now on race day. I have parking at the circuit and they have park and ride. Which would be our best option to use now we have a choice ? If we go park and ride I don’t have a bus ticket – is it possible to get one at the park and ride location ? There is availability for M1 Park and Ride on Friday and for Sunday. If spectators do not have a park and ride pass then they will not be able to park at the Park and Ride location. From my point of view… Park and ride is definitely a speedy option in and out of the circuit. Just depends if you want to additional cost after already purchasing a car park pass. Thanks for rapid reply James. So I assume that as I have 1 x Parking Pass for the circuit and the other 2 people have a Park and Ride parking & bus passes doesn’t stop us all going to the circuit parking with my single pass ? I.e. There’s no differentiation on the race tickets and a single circuit parking pass is ok for us all to get in in 1 car at the circuit ? Absolutely right! You could all jump in the car together it makes no difference. Best of luck and enjoy the race! Thanks James for the rapid reply. I have tickets for the sat and parking but i have to be at Birmingham Airport no later than 5pm on the sat. Im a bit nervous about queues getting out of the circuit. Should i be ok if i leave at the end of the qualifying? If qualifying finishes at 2pm and you hot foot it to your car then my guess would be 3 hours is enough time to get to Birmingham. Most people will be staying to watch GP2 and GP3 after qualifying so this is in your favour! Good luck and enjoy the weekend. Come back and tell us about it next week. Hi, it’s my first time at silverstone and I’m travelling 3 hours Friday morning and also have park and ride for the M1, what time would be best for arriving and do you drive to the park and ride pick up point and leave your car there? Hi Jasmine, Friday is the quieter of the the 3 days but it’s very difficult to say for sure how long the journey will take due to local traffic and time of day. I would allow a minimum of 30 minutes. Hi, I have to drop someone off Sunday morning, they have a car park E ticket, then leave to collect someone else. Im wondering if its best to drop the 1st person of at Taxi drop off area as cark park may be difficult to get straight back out of . Also how far is the taxi drop off from the circuit and do they walk or is it a shuttle bus? I wish you luck with that as it’s difficult to say how busy traffic will be. But from past experience your idea of a taxi makes sense. In the past they have made some of the roads one way (to the circuit). I think it would be best to call Silverstone direct on this one 0844 3750 740. First time going to Silverstone F1. So excited. I have a park and ride for Sunday race. Yellow ticket for the park and ride. Coming up from Cambridge direction. Should I use Towcester park and ride? Any idea of sat nav postcode for the park and ride. Hi Shane! Here are the Park n Ride addresses, hope they help! Please let us know what the Park and Ride service is like next week if you would! Hi Chris, Sorry I’m not sure on this one. Probably best to contact the ticket reseller. My son and friends are in hospitality on Sunday, and they want me to drive them there. Is it possible to get to the circuit for drop off or would it be an option that they be dropped off for, say, a bus ride in. Good luck with the drop off, traffic is sure to be very busy and I’m not sure about how easy it is to get back out. To make things easier roads are sometime changed to one way (towards the circuit) to help with traffic. You can check out buses at http://www.stagecoachbus.com/British%20Grand%20Prix.aspx. One thing to be sure leave home very early to make sure they enjoy the full day. If your friends can some share some pictures we’d love to see them. Hi I’m attending for Saturday qualifying and this my first first to silverstone and first experience in an F1 event s very excited! I have a pink/red car park pass saying to follow signs to the public car parks. I was told this was close the circuit. Could you confirm for me where I park and what number/entrance to look for please? Bearing in mind I’m bringing my young son what time would you suggest to arrive for and what entertainment is on during Saturday? You just need to drive to Silverstone circuit and then follow signs for car parking. From there you will be directed to the correct zone. A number of fans have reported queues this morning so it’s difficult to predict for the weekend. I wouldn’t like to say what time you should arrive but as leave as early as you feel comfortable! Thanks Simon. Bearing in mind the type of car park pass I have how far are those car parks from the Circuit and would it be walking distance from there or is there a complimentary shuttle service as part of the pass? Silverstone are advising customers who are collecting tickets to head to Head to Ticket Collection and the guys in there will take your car registration number. I have been fortuneat to get tickets for thi sunday via Tickets For Troops which comes with a Car Pass. Due to the Timings I have to collect the tickets and car pass fom the ticket office at the circuit. Am I able to park at/near the ticket office to collect my tickets and car pass befor proceding to my designated car park? I have been invioted as a VIP guest to Silverstone this coming Sunday and have been told the vehicle access is very busy. As the weather looks ok I may bring my motorbike can you confirm its ok to park motorbikes onsite close to the hospitality area as I will also need to get changed. Coming by Motorbike sounds sensible with the high numbers expected this Sunday. Although parking is Free for Motorbikes it’s not clear where you can park. Have you tried contacting the hospitality provider? First time going to Silverstone F1 with my 8yr old son, we are both so excited. I booked Park and Ride for all 3 days (Fri – Sun) and have received pink tickets for the M40 Hinton Airfield P&R. We are travelling from Cheltenham direction. However, looking at the very small print in the leaflet received, it’s stating that buses are only running on the Sat and Sun!! Is this true (I hope not) and if so where is it best to park on Fri without a ‘parking ticket’? Park and Ride sites are open from 5.00am on Friday 4 July 2014. First buses will depart for the circuit at 6.00am, with the final departure from the Park and Ride site at 10.30am. Buses will start return journeys from Silverstone back to the Park from approximately 4.00pm, with the last bus leaving the circuit at 6.30pm. Many thanks Simon, very much appreciated. Hi James, just to keep you updated re Hinton airfield Park n Ride, it was closed today 🙁 So I phoned Silverstone and they said park at Silverstone and go to ticket collection and let them know info and I should get a car pass for that day. Fair enough that’s exactly what happened (well I just had to write my personal details and car reg on their form and that was it) so all was not lost. Had a fab day too! Got a red car pass that came with my tickets. Says follow signs for public car parks. How can I tell which car park this is valid for? Thanks. Hi Simon. Ad the ticket states, just follow the signs for public car park and you will be directed from there. They try to make it as simple as possible so I’d go with what the ticket says and you’ll be fine. Enjoy your weekend! I have one of these as well! So we just drive directly to Silverstone circuit? (I parked and rode last year so am a tad confused!) thanks! Hello, We would like to travel from Northampton using the Sixfields park and ride service, but we dont need to park. Can we take the bus without the parking ticket? Hi Chris. My understanding is you would be turned away for not pre-booking a park and ride ticket. The bus service is reserved for people that have paid for this service to our knowledge. Hi coming in fro Essex with clients,I have car park pass for East Hospitality parking P26, how easy to get in & out , is this well signposted? Hi Nigel, Getting in is easy but it is expected to be busy. Simply follow signs for Silverstone and then follow the parking signage. You will be then directed to your parking zone. The roads are changed for race day to one way (either to or from) to help but do expect queues. We have been given tickets to Saturday, however don’t have a parking ticket. We will be travelling from Banbury and looking to either get dropped off or get a taxi, thoughts? Are there any other suggestions from Banbury that you are aware of? Hi Becky, you can catch a Megabus from Banbury station. Hi. We’re staying in Thrapston and are booked into the Purple Park & Ride at Sixfields. Directions on the ticket only say how to get there from the M1 but we left the M1 half an hour or more before getting here and don’t know the area so don’t want to go round in circles. Can’t find a postcode for sixfields to help get there. Does anyone know it? Thanks for the quick reply Simon. Have you tried BookF1.com? They have options to book Parking at the circuit or Park and Ride for the M1 and M40. You can also select parking for 3 days or select the days individually. Click here for more information or to book parking for the British Grand Prix with Book F1. As you’ve mentioned it’s very busy on a Sunday so the earlier you can make it the better. Thanks Simon. I’ve not been since they introduced the park and ride service so just trying to get an idea from anyone who has used it of how long to allow for getting into their car parks and onto a bus once you’re off the motorways. Any comments on how big the queues are at the gates for the first couple of hours after they’ve opened? They used to be pretty huge when I went back in the 90s! I can’t seem to find a Park & Ride option for the M40 this year. Does this no longer exist? We’re looking for an affordable place to park heading from the North West, so the M1 isn’t ideal. These are not on sale yet, but may be available at a later date. When can we book Park and Ride tickets from Towcester Racecourse to the GP just for 5th July and not for all 3 days . The http://www.bookf1.com website doesn’t give this option at present. Last year I believe the cost just for the Sunday GP was about £6 – what is it this year please and when can I book for this parking? I assume the ticket would then come as before with the main entry tickets into the GP (which I have already booked and paid for)? We’re waiting for BookF1 and Silverstone circuit to confirm if they will be offering single-day M40 Park and Ride and also a Sunday-only option for the M1 Park and Ride. Silverstone Circuit are currently trying to secure additional locations for the park and ride. However, park and ride, Whittlebury Park and Circuit parking are the only options BookF1.com will be providing. Hi Guys, what are the arrangements for coach parking on the Sunday for the F1? What charges are there and will there be any toilet facilities for drivers? I’ve been given tickets for the Sunday as a gift however by July I will be 6 months pregnant so we are trying to work out the best place to park with the least walking. As we have general admission tickets it looks like we will be best to head to Copse/Becketts area. Please can you advise the best place to park or would Park and Ride be best? From what I can see Whittlebury Park may be best but does this involve a long walk? Thanks. It really depends on where you’re planning to watch the race. Whatevere you choose I’m afraid there’s going to a be a fare amount of walking. What I would recommend is an early start as traffic to Silverstone builds up early Sunday morning. Check out the best options and prices here. I’ve had a good look but can’t find anything on Sixfields Park and Ride this year. The options are ..
Hello! My family are attending the race this year. 1) Where could I drop them off/pick them up by car without purchasing the parking permits? 2) What time approximately do the races finish on Saturday and on Sunday? 3) We have a very long journey back home on Sunday afternoon. We could go either via Northampton or via Banbury-Warwick. I could pick them up from Silverstone or meet at the bus stop somewhere else. What is the fastest way for us to get out? One other option is to drop them at Silverstone Village taking the back roads, check here. It’s about 1 mile walk from the village. The map half way now the page shows a back route. Gates open at 6 am and var parks opens 30 minutes prior to that. I’m about to purchase 2x Sunday tickets. We’re not sure what to do about the parking/park and ride/dropping the attendees off. Can I purchase the race tickets now and then the parking tickets (which ever we chose) at a later date? My partner is not convinced about the 5.30am Park and Ride, he thinks they’ll get there too late for decent seats/areas – is this true? Personally the P&R vs Circuit Parking price is a no-brainer. You can certainly buy your parking tickets later but we’re not sure what availability will be like. I spoke to Silverstone last week and was informed the buses have priority lanes so you shouldn’t have a problem. The roads changes to one way to the circuit in the mornings to improve traffic although from past experience it’s still very busy and worth an early start. Me and my wife have tickets for this years event and are looking to book some kind of transport, but are finding it a bit confusing. We are staying in Towcester, what is the best way to the circuit. Does the M1 park and ride pick up from there? You need to drive to the park and ride site at junction 15a of the M!. Ticket for the Park and Ride need to be purchased in advance. We’re travelling over from Ireland and hope to make it for the second practice session on the Friday – what time is it? 2pm? Also, we’re staying with friends in Hungerford so I’m going to drive them to Banbury each morning to get the Megabus in – does that sound a good option? What’s the best way for them to get there on the Friday? Would there be buses from Banbury or should I drive them to a Park and Ride so they can get a shuttle bus in? Practise on Friday is 2 to 3:30. Thanks a million – all booked now 🙂 Pity the courier prices are so expensive for sending out the tickets! Madness £37! Also, the Megabus says it leaves at 4:30 each day, what time does the race actually finish on the Sunday? And what about Saturday? Thank you! I have recently purchased tickets for the 3 day weekend experience at silverstone for the grand prix. I have also purchased park and ride at sixfields stadium, as this is going to be my first time visiting I have no idea what to expect. My intention was to go home after each day and return the next day, is this possible or do we have to leave the car at the park and ride and then camp/stay for 3 nights? I appreciate I have left this quite late but your help and urgent response would be appreciated. Hi Simon, I will come by motorcycle, I see you’ve posted it is free. But where do I park it? Still park and ride or should I come to the circuit? Thanks. Is the car park (east) only for hospitality guests, or can any book to park here? Hi, it’s my first time using the park and ride, doing from sixfields. If we get there for 5:15 ish what is the rough likelihood we’ll be able to get on the 5:30 buses? Is there much queuing to get to sixfields at that time? Thank you! Hi I paid £50 for circuit car parking but my pass says ‘Public Car Parks’! What does this mean? Is it circuit car parking or not? It doesn’t say where these are either. Can you help please? If not circuit parking, will I get a refund? I’d recommend speaking to the reseller to check the parking you have. The Hungaroring is a motor-racing circuit near Budapest, in Mogyoród, where the Hungarian F1 Grand Prix is held 24-26 July, 2015. For this event our company provides transfer. Can you please advise what block in international pits straight would give my son and I the best view?? You need to avoid the area towards the Abbey Grandstand as the view of the pits is limited due to being on a hill. The top manufactures are at the end towards Club corner. When you book tickets make sure you request area 1, 2, or 3a. These seats are popular so i would recommend buying them as soon as you can. Hi. I’m a bit confused with how the “Park + Ride” works? I’d like to use the service but wish to travel in someone elses vehicle. Does everyone in the car have to pay the £25 weekend fee or is it just for per car? It doesnt really give you any options on the booking page as i’m only buying 1 ticket as others already have theirs race tickets booked. Hope thats not too confusing. The Park and Ride charge is per vehicle parking pass (the shuttle bus is free). So I can just jump in with someone who has paid £25 for the weekend Park & Ride & get on the free shuttle. That’s great. Thank you very much for your reply. Hi, sorry another query about Park and Ride. If I buy a 3-day P&R ticket, but arrive at the P&R on foot or by taxi, would I still be able to get the shuttle or do I need to park a car there as well? Good question Nic! difficult to see why they wouldn’t let you take the shuttle after all you’ve paid your money and they have room for another car. I’m trying to book tickets for park and ride from sixfields stadium for the 2016 GP. Do I book tickets via the stadium? If not can you point me in the Wright direction. Hi Peter, Apologies for the delay in getting back to you. please see BookF1.com for details on parking. How long does it take to get in from the m40 on race day? Hi Dan, I would allow a couple of hours but it depends on what time you plan on getting there. The circuit starts getting buys from 6 in the morning. I have a ticket for Sunday (2016) f1 : Becketts Seat S0180 where is this situated in the grandstand and which would be the best car park for me to book into that is the nearest to Becketts, thanks. Me + a friend have both bought weekend tickets but only 1 of us has bought a Park + Ride ticket. It seems that we only need 1 ticket per car but instead of parking at Sixfields, we intend to take a taxi to Sixfields (as we’d like a drink or 2). Will we be able to enter the Sixfields area in a Taxi and both be able to travel on the 1 P + R ticket. Hi Simon, Sorry i don’t know the answer to this, but I can’t see why you should have a problem if you’re paying for a space. Maybe your taxi driver will have to park up for a few minutes until you’re underway on the shuttle bus! The shuttle bus is free so no problem with travel for 2. Hi me and my son are going to this years silverstone gp 2016 and are wondering is it possible to get dropped off by a car and collected afterwards? Hi Dan, I wouldn’t recommend it. The traffic is very busy. I might be best to be dropped at Milton Keynes or Northampton and use the local bus services. Buses will be operating throughout the weekend from Milton Keynes Central train station, Northampton train station, Northampton bus station & Sixfields football ground, to Silverstone Circuit. There is no need to book, just turn up on the day and pay the driver. My mum and dad are coming in on an organised coach trip. I can’t find a map of where the coach park is, to then give them directions to where they need to be. Can you help? Hi Andy, There’s a number of car parks at Silverstone. I’d hate to direct you to the wrong place. Have you contacted the coach company? I’ve left it too late to get Park & Ride from Towcester (didn’t realise!). What are the chances of being able to get the shuttle bus from the Towcester P&R if we get dropped off there and walk to the pick up point? Will I need an actual P&R ticket to board the shuttle bus? I will be parking in carpark 26 on Sunday. (Silverstone Six Hospitality) Will I be ok to collect my car Monday morning? I plan on driving to the venue and then have an hotel booked Sunday night. Hi Lee, I’d recommend contacting your Hospitality provider on this one. They should be able to advice. Hi, I am going to Silverstone on Sunday for the first time, and have paid for P&R off the M1. I am trying to decide what time to leave, we will be travelling up from Suffolk & just wondering how busy it gets when getting close to the P&R site? The journey time currently is showing 2hr 30min, do you have a rough idea of what I should add onto that to allow for traffic? I’d like to be at the track around 8am. Hi Mark, It’s so difficult to say, Sunday is the busiest day of the race weekend and cars are queuing to get in the circuit before 6am. I would add another hour to your journey at the very least. Hi, I am going to Silverstone for the first time, I am staying in Rugby over that weekend. Is there any public transport to the circuit from Rugby. If not then i will probably drive to one of the park and rides, could you advise which one is best to use driving from Rugby, the M1 or the M40 I have no idea of the roads around there. Hi Pete, There’s a couple of options for you. If you’re driving I’d recommend the M1 as Rugby is very close to the M1. If you prefer to go by train it’s about 50 minutes to Milton Keynes, where you can take a courtesy coach to the circuit. We are staying at souldern in a cottage and want to get dropped off cause the wife needs the car can you advise me the best way to get to the circuit …..
Hello, I am having difficulty working out the Towcester park and ride – how do I book please?